Variable luminance artificial sky with integral sun. 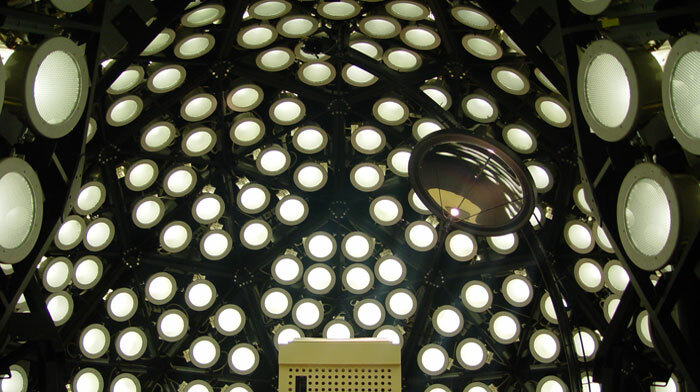 The Bartlett's lighting simulator aids comparative lighting studies at the earliest stages in the design of buildings. The lighting simulator is used as a facility for practising architects and lighting designers, as well as for teaching and research. This exceptional facility is one of the most advanced in the UK. It comprises a large (5.2m diameter) geodesic hemispherical dome, covered with an array of state of the art light sources and diffusers. As a large-scale facility, it precisely creates the realism and accuracy which today's architects and lighting designers require. Each of the dome's 270 energy efficient, compact fluorescent luminaires are individually controlled in order alter the luminance distribution, thereby accurately modelling different sky conditions. A computer controlled artificial sun traverses the sky dome, enabling almost any sun trajectory to be modelled for conditions in either the northern or southern hemisphere. This combination of the sun and sky enables the diffuse (sky) and direct (sun) components of the lit environment to be modelled accurately and simultaneously in any geographical location, at any time of the day and year.